The rich ruby tones of this agate necklace from Kenneth Jay Lane will give every outfit a vibrant spin this season. 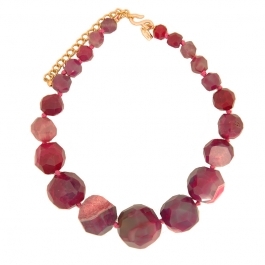 This piece features 10 hand carved faceted agate stones in varying shades of deep ruby through to pale pink. Hand strung on silk thread with a 22k gold plate adjustable fastening. Approx length 52cm. Add impact to your wardrobe this season with this stunning statement agate necklace.